8% Iron Chelate is a high analysis liquid product that contains the best quality sources of Ferric available, completely chelated, using plant beneficial compounds to promote plant health and vigor. Not another “me too” product – our proprietary pre-digestion process yields an organically, and biologically chelated, “Next Generation” Iron product that delivers results! Rich in organic acids and plant beneficial compounds, this product is effective on all types of turfgrass and conditions. 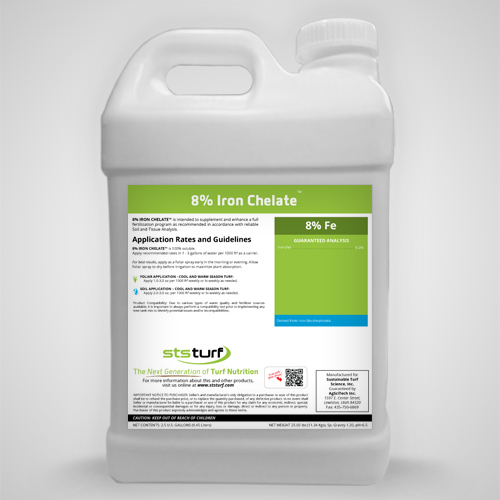 To deliver all the essential micronutrients in balance, combine 8% Iron Chelate with Micro Max in the desired ratio of Iron to Manganese, to ensure delivery of all needed micronutrients. 8% Iron Chelate is organically chelated using plant beneficial organic acids, biological processes, and fermentation extracts. The biologically chelated fraction also delivers valuable exudates. The combination of iron sources, vitamins, enzymes, and chelating technology, provide both a quick visual response and extended longevity. The addition of Solu-Plus works to maintain nutrient availability, enhance absorption and/or root uptake. Injection/Fertigation Rate / Acre 1.0 - 2.0 qts.